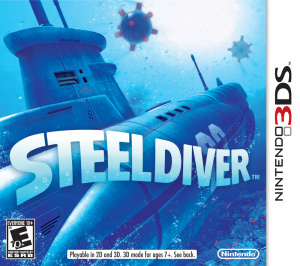 For those who aren't aware, Steel Diver began life as a demo for Nintendo DS and almost became a full game before being moved over to the 3DS. Combining simulation aspects of submarine driving with arcade-style action elements, the game is one of the more impressive demonstrations of the system's 3D and hardware capabilities. But while you'd be hard-pressed to find a more unique experience in the library of 3DS launch titles, there are a few caveats that must be taken into careful consideration for those thinking of adding the game to their collection. It's fairly difficult to place Steel Diver into any one specific genre classification when you take into account its rather diverse gameplay schemes. On one hand the game has a very heavy simulation feel with its more realistic submarine driving controls, but on the other its intense action elements and strategy overtones lend even more of a diverse feel to the overall package. A lot of it depends greatly on which mode of play you choose, as each one offers a very different playing experience, some more exciting than others. 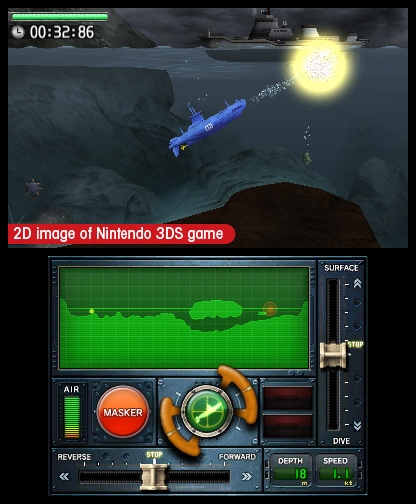 The main mode in Steel Diver is the Campaign Mode. Here you can take on missions that offer both navigation challenges and unique periscope battles to top things off. There are eight missions in total including the Training mission you begin the game with, each offering a gradually more difficulty set of challenges, although none are overly challenging given how little damage your sub generally suffers. Your ultimate goal is to reach the target spot at the end of the level in one piece. This will require you to navigate your ship using its speed and depth controls on the touchscreen, and also fire off missiles and torpedoes in order to take out obstacles and enemy ships that try to stand in your way. Given that you can play these missions using three different submarines of varying size and weight, each of which handle a little bit differently, there's a nice layer of replay value to go back and play previously-completed missions with a different submarine, a nice touch given the seriously limited number of missions. Periscope Mode is probably the more flashy of the choices and pops up during the Campaign Mode after you've completed the navigation portion of the mission, as well as having a Mode all to itself. In this mode your viewpoint is changed to that of a real periscope view and allows you to scroll around in all directions by moving your 3DS system itself around. While this is not terribly practical if you're sitting down, it's such an interesting feature that it's worth standing up and swivelling around just to see the scenery in the game move around with you. Using the targeting reticle on the screen you can target enemy ships with your sub's torpedoes. Of course you'll have to lead some ships with your firepower, making concessions based upon their speed of movement. Once you've destroyed all of the enemy ships your finishing time will be recorded, giving you something to shoot for the next time you play. The final mode of Steel Diver is the Steel Commander strategy game. This game combines some action elements from other modes with hints of the classic board game Battleship, pitting you against either the CPU or another player via Download Play in an all-out war of strategy. You'll be able to place your various ships around a hexagonal grid and then take turns trying to locate each other's ships and destroy them. Some battles will take you to periscope mode where you can hunt down and fire torpedoes at your opponent's ships whereas others will come down to a dropping of depth charges that's more a matter of blind luck than strategy. It's certainly not the deepest strategy experience around, but it's a nice diversion from the main game and a good way to get another player involved. There's a very refreshing feel to the simulation-style gameplay of the Campaign and Periscope modes that give the game a far more interesting feel than if it were just a standard arcade-style action title. While this does provide a slower and more deliberate pace, it will make you stop and plan out your moves a lot more too. The exciting Periscope Mode also does a fantastic job of showing off the 3D depth and makes you feel a lot more involved in the battles when you find yourself spinning around with your system in your hands. Even with the slightly cumbersome navigation of the heavy subs, the solid controls always give you the luxury of knowing that if you mess up it was your own fault, not the game's doing. 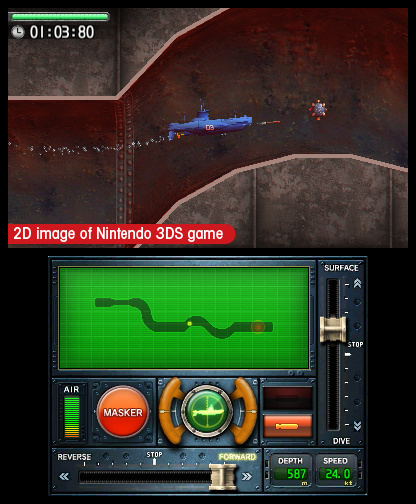 To say that Steel Diver makes great use of the system's 3D depth would be a gross understatement. Not only does the game's 3D visuals do an outstanding job of really drawing you into the surroundings, but it also provides plenty of moments that will really wow you with its depth and realism. 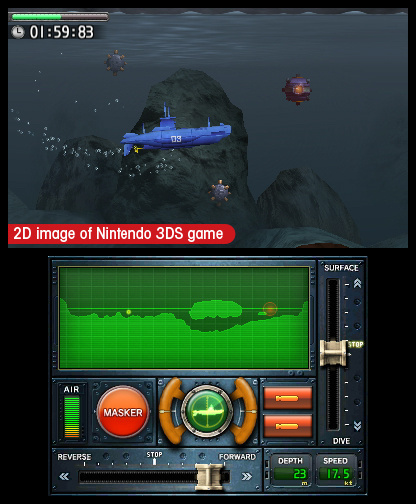 Even the simple underwater areas you'll be traversing really spring to life on the 3D screen. It would have been nice to see a bit more size and detail with the submarines themselves, but the flashy moments spent tracking down ships on the storm-laden seas in Periscope Mode more than make up for the few slightly average visual moments that pop up. 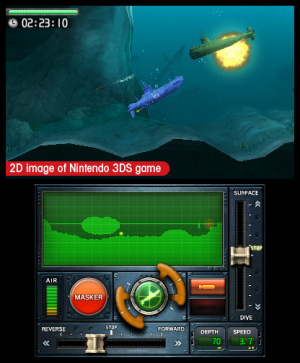 Given the setting and gameplay style of Steel Diver, the military-infused musical score the game makes use of is rather fitting. There are some good music tracks throughout the game, but they're played out in such a subtle fashion that they don't tend to stick out very much in the overall scheme of things. The game does toss some voiced dialogue your way, even doing so with the slight bit of echo effect of real-life radio commands blaring inside of a submarine. Even the firing torpedoes, sonar, and explosions are extremely realistic further enriching the audio presentation. Steel Diver is easily one of the more creative titles in the initial 3DS lineup and offers a nice glimpse of the type of innovative gaming experiences the system has to offer. Unfortunately it feels at times like the developers spent too much time on the actual gameplay ideas themselves and not enough time surrounding those ideas with content: it just doesn't have enough bang for your buck. Good review Corbie. I'm glad that the game had a lot of depth in terms of gameplay, but shamefully the content lacked depth. I guess the developers didn't have enough time to cram more content to this game before launch. I may get this, but only when the price drops, or if it was made as a 3dsware title when I get the 3DS in the future. 6/10. Yikes. When I saw the review, my attention perked a bit, regardless of the fact I was never interested in Steel Diver. Oh, well. Plenty more better games to come. Nice one, Corbs. Yes... unless amazon has a discount of like 20%... wont get it. Sounds a thousand times more interesting than I thought a sub game would be, especially periscope mode. Excellent review. I'll be getting this when it is released in the UK. It sounds like it has some good ideas. I reckon this one will be a game that I will pick up once it's pretty cheap. "Even the firing torpedoes, sonar, and explosions are extremely realistic further enriching the audio presentation." I lol'd when I read this, I was beginning to think you weren't going to use even once. It wouldn't be a Corbie review without at least one even. Hhmm, shame about the lack of content, but I still want this, if and when it is released. "sub-par content" is the theme for the 3DS launch, huh? Well I guess it's normal to rush launch games. Can't wait for the real games to start releasing. Shame about the potential this game (and PIlotwings) has, if only they had more/better content. This game doesn't seem quite Nintendo, Visually and imagination wise, they played it kind of generic by the looks of it. Wasn't Nintendo themselves saying this is the 3DS launch title they were most excited about? Too bad it turned out lackluster. Good and thorough review overall, and yet... I'm not sure I agree on the issue of content. In a reversal that certainly surprised me, I'd say that Pilotwings is the one most severely lacking in content, while Steel Diver offers more hours of gameplay than meets the eye. According to all reviews out there, you can basically attain a perfect score on all the missions in Pilotwings within 2-3 hours. The free flight mode, in my case at least, adds nothing, as I've spent countless hours exploring every inch of that (unchanged) island in WS-Resort. Steel Diver's missions alone will take you more time than that, if you go through all 7 with each different sub. The periscope mode doesn't add much (although it's been a huge hit when showing off the system to friends), but the strategy game surprised me with a lot more replay value (even for a single player against the CPU!) than expected. 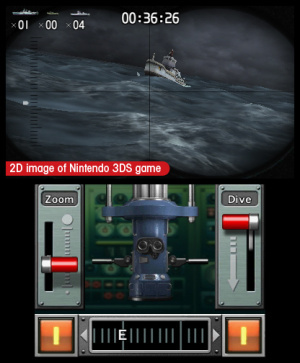 I thought it was just Battleship, but in fact it's a fascinating turn-based strategy game against a clever CPU, in which you have to weigh the costs of various strategies at each juncture: attacking means revealing your sub's location, and sonar means giving up a turn; the arrangement of your ships is not random but is a matter of moving them so that their zones of sight intersect to pinpoint the enemy sub location. Each turn you have to deal with avoiding damage, locating the opponents sub, and trying to make your own attack, yet you can only carry out one action so your decisions have to be well thought out and strategic. Anyhow, I think an easy case can be made that this game is not only much more original than Pilotwings (which I believe you'd concede) but also in fact offers a good bit more content, and certainly more variety in its total package. As I said, this all surprised me, as I expected Pilotwings to have more than the unchanged island and a set of missions. Thanks for the insight wariowoods! I like pilot wings so now I think I might like this game more then I thought I would. Still going to wait though because I just spent 450$. lol, could tell just by seeing the commercial that I would hate the game just for one thing: "Fire!" "Fire!" "Fire!" "Fire!" in the same monotone every time. Well I got this 50% off from the Toys R Us deal. So a $20 game like this isn't too bad! @warioswoods I must be terrible at Pilotwings then, I've clocked up over 8 hours so far and still have a loonnnng way to go to 3 star all of the challenges! Great review too bad about the lack of content, but I think I'm still gonna get it once I have some money. If this drops in price, I'll definitely pick it up. Your description of Periscope Mode sounds pretty bodacious. Nice one Corbs. Well, content issues aside, it's definitely not for everyone, but I do love the pacing and relaxed, strategic style myself. I also agree about the beauty of those 3D visuals, like a little aquarium behind the glass. @pixelman I see what you sub-did there. This review and warioswoods makes me want the game, but not for $40. This game screams for a more in-depth and content-filled sequel. Lol found out how to cheat on 3DS and get extra play coins. All you has to do is go back to 2010 on the date and take 1000 steps. WARNING this WILL mess up the activity log. Besides that, Steel Diver looks like a game I would play if I wanted to get relaxed, and looks like a decent game, so I will get it sooner or later. I'll just head on over to ToysRus and buy this with either Ridge Racer or Ghost Recon, so it is like I'm only paying $20 for the game anyway...That deal goes on until Sunday, right? Kinda interested in this one. Like the look of the periscope function. Plus the touch screen controls seem nice. I wanted to say that I don't regret buying this game, but there are some other annoying factors I didn't see mentioned. Periscope mode comes after completing a mission mode only allows you to play for 30 seconds. During that time you can earn "decals" which are a nice bonus for your sub. The problem is you can only get a few in the 30 second time period and you need a minimum of 3 for the decals special effects to work (i.e. damage to your sub decreased). So this means you have to play one of the eight missions over and over again at 5 to 10 minutes to collect all the dozens of decals 3, 5 or 7 times. You can play Periscope mode from the main menu for a long time, but not earn decals. Having said all that I still enjoy the game play, music, and 3D-niss of it all. It just seems like too much work. I was originally thinking of getting this instead of PilotWings, but ultimately decided on Pilotwings because of the brightly colored visuals and the fact that there are more than seven missions in the game. Had they added more missions, there would have been more replay value to the game. "But while you'd be hard-pressed to find a more unique experience in the library of 3DS launch titles, there are a few caveats that must be taken into careful consideration for those thinking of adding the game to their collection." Thank you for resisting the urge to say "for those considering to take the plunge." Pre-ordered it this past weekend and I'm sticking with it. I had a go at this game at a demo event - it was one of the games I was looking forward to trying. I only got to try the periscope mode, and that was pretty fun (and the 3D looked superb). My only concern, as the review notes at the end, would be that it might get a bit tedious after a while. Combined with the other play modes it might make it last longer however. @ Warioswoods - I think Pilotwings Resort is a much more well-rounded game. At least the three different vehicles have more differences to them than just size and weight, so using them offers a very different experience each time. Plus the Periscope Mode was only really fun in short spurts and the strategy game just seemed to rely far too much on random luck than strategy and skill. Plus the island in Pilotwings Resort is huge and much more intricate and explorable than the tiny confines of these missions on Steel Diver. I appreciate what Steel Diver does from a innovative gameplay aspect, but it doesn't have nearly the amount of diversity or content that Pilotwings Resort features. Really not even close to me. But I stand by the fact that the content in Pilotwings is severely reduced by the fact that I already know every pixel of Wuhu Island like the back of my hand. Steel Diver contains a whole host of truly original locations and graphics — some of the most gorgeous backdrops I've ever seen on a handheld, in fact — while Pilotwings features almost nothing original or surprising. The subs, by the way, differ by more than just size and weight; they are basically three different difficulty levels, with the first being only a matter of controlling depth and throttle, the second introducing the need to adjust pitch forward or back, and the third making pitch fully analog and crucial to maneuvering. You didn't mention at all one of the most important features for replay value, which is the ghost data. You can race against your own ghost on any level, and can also race against the developer's ghost, which adds a whole new level of difficulty to even approach their speed. I learned all kinds of advanced tricks just by trying to keep up with those ghosts. You also didn't mention, although it's fairly minor, that there aren't just the 7 mission maps; there are also 8 time trial maps, which are not the same maps at all. Sure, they're simple maps with a series of obstacles and no enemies, where the key is ship control and not combat, but they offer an entirely different diversion from the missions, and add to the overall content. Lastly, those stamps you can earn are modifiers that do significantly change your sub's abilities and encourage replay; you might be able to attain a much faster time, for instance, if you enable a certain stamp that lets you bang against walls with minimal damage or one that affects your combat, etc. It's a whole layer of modifiers, that again has no parallel in Pilotwings. makes me want to buy it, but not for 40$. another title that could fit into the ware shop department. if i ever see they patch it up for free and add content, or even bonus packages, ill get it for sure. I'm not writing an instruction manual here, I'm just here to give an overview of things. I'd kind of like for players to be able to discover some of these things for themselves. Would you like for me to come over and hold their hand while they play as well? Ha, I wasn't meaning to sound critical, just pointing out to potential purchasers why the content might sound lighter above than it actually is; with no mention of time scores or ghosts, it sounds like the sole reason to replay the eight sixteen maps is to use a different sub, while the main attraction for replay value is actually to beat your best time (or the developer's challenge) via the ghosts and modifiers. Admittedly, it's an odd contradiction: a slow-paced game that focuses its scoring and extra challenges on speed. Yet, if you're into that sort of thing, it means great replay value (I replayed just the first two missions countless times before being either bored enough or satisfied enough with my score to proceed). Just making my stubborn case and offering an alternate view, if anyone was turned off by the description. I'll go back to my rocking chair now and find something else to complain about. I agree, what the game does offer is great fun, it just doesn't offer enough of that fun. A sequel will fix the lack of features, just give it time. My first 3DS game. I go with an 8 for this. I love submarines so I was pretty interested when I first heard of this game. Love it. This game is on clearance at most Kmarts for $4.99 new. Why can Xenoblade be as cheap as this game? This game got $35 cheaper over three years, so why is Xenoblade pricier than any Wii U title even though it's been out for about a half a decade?